« Episode 28: Video Game Movie Tie-In’s! Despite being left somewhat on the fence by the way Harlan Ellison’s unedited story was progressing in Issue # 2, I was still very excited to see the continuation. And, here we are, at Issue # 3! At this point I am pretty well committed to sticking with the Juan Ortiz covers for this series, both for consistency’s sake and because I think his art direction feels more closely linked to the story. If money permitted and I had a proper way to display these fine works of art, you can be sure that I would gladly buy both versions of the cover. Whether you go with Juan Ortiz or Paul Shipper, you are going to get a fantastic work of art with the cover alone. The story picks up with Kirk and Spock taking up refuge after narrowly avoiding an angry, racist mob. The dialogue between our protagonists is much more intense and heated than in the TV episode, which I can understand given the impossibly overwhelming situation that they are placed in. The only bad things about the argument between Kirk and Spock (which primarily concerns the wretched state of humanity in the 1930s) is that the original, unedited dialogue feels very out of date with what was already, or what was about to be firmly established about Spock and the Vulcan race. Spock reacts much more emotionally to conflict in this version of the tale, and the talk about how humans uplifted Vulcans (instead of the other way around) feels odd. But these little details pale in comparison to the gorgeous artwork and breathtaking drama that permeates the pages of this comic. Edith Keeler is introduced into the plot in this issue, just as she was portrayed on TV by the stunning Joan Collins. The magnetism between Kirk and Edith jumps off of the pages like electricity. Reading this comic, for me, really is the admiration of art. This issue is exactly in the middle of the mini-series, and spends most of its time developing Kirk and Edith’s relationship, as well as Edith’s role as a focal point in time. Through means similar to what was utilized in the TV episode, Spock reasons that Keeler is the point in time that they have been swept to. Those of us fans who adore the aired episode know what tragedy is to come, but seeing this alternate take on the drama makes it feel like a new story all over again. 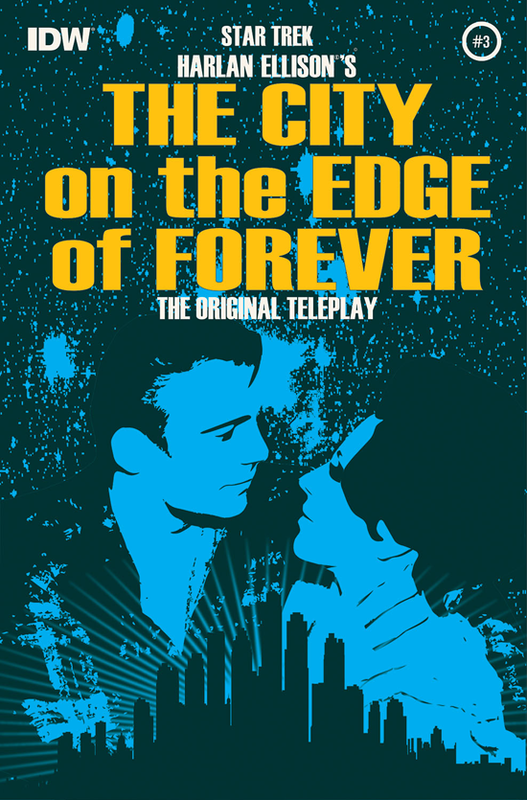 This Uncommon Geek is enthralled with IDW’s “The City on the Edge of Forever,” and despite a few nitpicky details, these issues make for a wonderfully engaging read. They belong in any respectable science-fiction or Star Trek comic book collection. Issue # 4 will be reviewed tomorrow! Easily one of the BEST TOS episodes ever!!! nice review..